CPU (Central Processing Unit): CPU act as a mind of any processing machine. It synchronizes and manages all processes that are carried out in microcontroller. User has no power to control the functioning of CPU. It interprets the program stored in ROM and carries out from storage and then performs it projected duty. CPU manage the different types of registers available in 8051 microcontroller. Interrupts: Interrupts is a sub-routine call that given by the microcontroller when some other program with high priority is request for acquiring the system buses the n interrupts occur in current running program. Interrupts provide a method to postpone or delay the current process, performs a sub-routine task and then restart the standard program again. Memory: For operation Micro-controller required a program. This program guides the microcontroller to perform the specific tasks. This program installed in microcontroller required some on chip memory for the storage of the program. Microcontroller also required memory for storage of data and operands for the short duration. In microcontroller 8051 there is code or program memory of 4 KB that is it has 4 KB ROM and it also comprise of data memory (RAM) of 128 bytes. Bus : Bus is a group of wires which uses as a communication canal or acts as means of data transfer. The different bus configuration includes 8, 16 or more cables. Therefore, a bus can bear 8 bits, 16 bits all together. 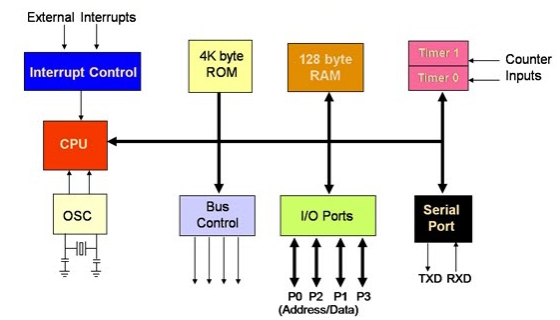 Address Bus: 8051 microcontrollers is consisting of 16 bit address bus. It is generally be used for transferring the data from Central Processing Unit to Memory. Data bus: 8051 microcontroller is consisting of 8 bits data bus. It is generally be used for transferring the data from one peripherals position to other peripherals. Oscillator: As the microcontroller is digital circuit therefore it needs timer for their operation. To perform timer operation inside microcontroller it required externally connected or on-chip oscillator. Microcontroller is used inside an embedded system for managing the function of devices. Therefore, 8051 uses the two 16 bit counters and timers. For the operation of this timers and counters the oscillator is used inside microcontroller.